Warm ocean breezes, natural light and little birds chirping. Thank you Mother Earth! Paraiso Yoga is nestled just a few moments from the beach and village centre, offering a mix of yoga classes to practice and study. 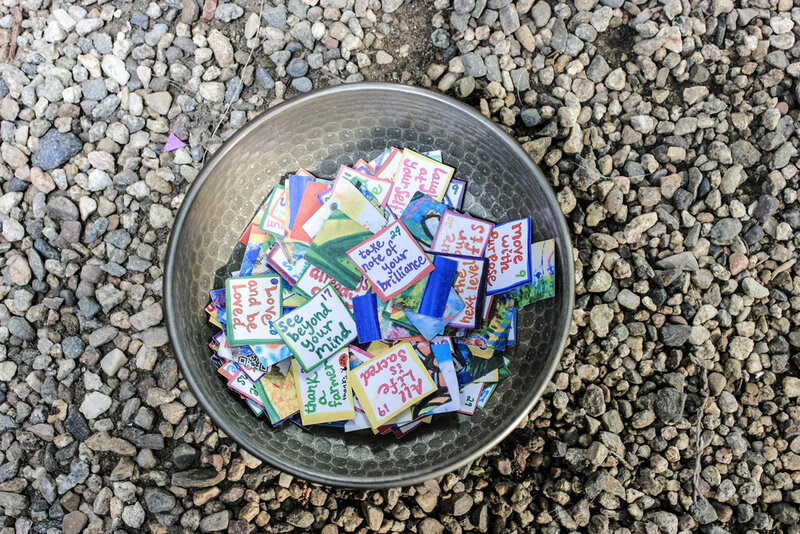 Pick out a colourful affirmation and make your way down a stone path through the garden. You’ll enjoy the playful scenery, displaying numerous statues and sayings. My personal favourite: “Hold the vision, trust the process”. At the end of the path, you’ll find a set of leafy-coloured steps up to the floor. Every other step is painted with an intention, feeding your mind with powerful reminders before you step on to the mat. It’s an intimate space to relax and focus. You have just enough room to feel comfortable but also connected to the group. If you can snag a spot on the right side of the floor, you’ll appreciate overlooking the lush tropical garden below. From sunrise to sundown, there are classes available for all levels. I was lucky to experience both times of day, enjoying the birds singing as the sun rose, and the crickets chirping as the sun fell. At sunrise, I got down with Vinyasa Flow. A class focused on synchronizing movement and postures with breath. The deep postures help to internalize your focus, in turn strengthening your awareness and concentration of the mind. During sunset, I soothed my body and mind with Hatha. A class for both beginners and advanced yogis, you can take it as far as you like. It focuses on the principles of strength and flexibility, and consistency and convenience (Sthira and Sukha). It is love for the whole body. Paraiso Yoga is an authentic yoga experience, and a beautiful way to start and end your day of relaxation and adventure in Sayulita. Muchas gracias Nara, Jette, Jose & PY fam.